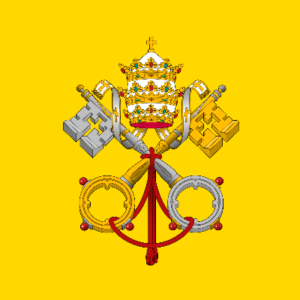 Pope Francis keeps saying the right words but he doesn’t appear to be making much headway in cleaning out the Augean stables at the Vatican. There is ample evidence that his religious colleagues and underlings are dragging their heels determinedly over child abuse allegations and now over admissions that nuns have been and are being abused by priests. He said the Church was attempting to address the problem but said it was “still going on”. Last November, the Catholic Church’s global organisation for nuns denounced the “culture of silence and secrecy” that prevented them from speaking out. Speaking to reporters while on a historic tour of the Middle East on Tuesday, the pontiff admitted that the Church had an issue, the roots of which lie in “seeing women as second class”. 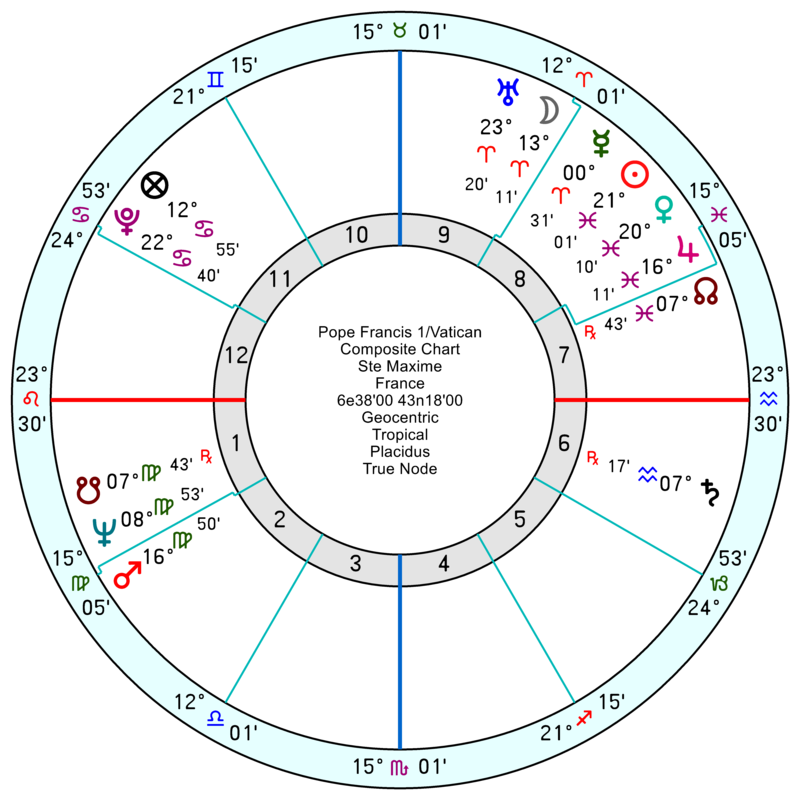 Pope Francis’s Election chart, 13 March 2013 7 pm Rome is aggravated and divisive to start with having a volatile Mars Uranus conjunct the Descendant; though also with a potential for having a positive effect on mass consciousness with a Yod apex point Jupiter. 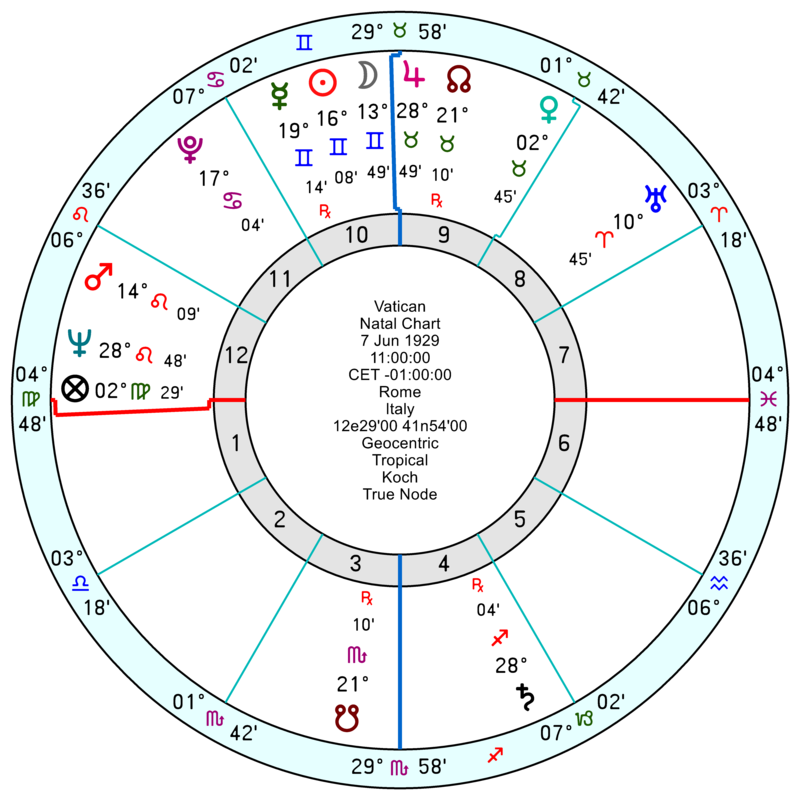 It’ll be at boiling point in six months time with the Solar Arc Mars closing the conjunction to Uranus to exact; and in for more massive jolts by 2021, if he stays around that long. He’s probably now all too aware why Pope Benedict chose to resign against tradition and may take the same route out. 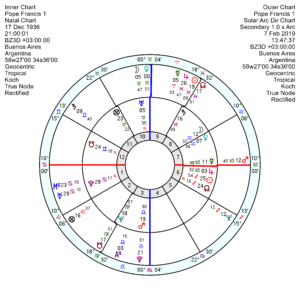 On his own chart, 17 December 1936 9 pm Buenos Aires, he does have tr Uranus conjunct his Midheaven (time being accurate) which suggests a sharp change of direction in his life/career very soon. 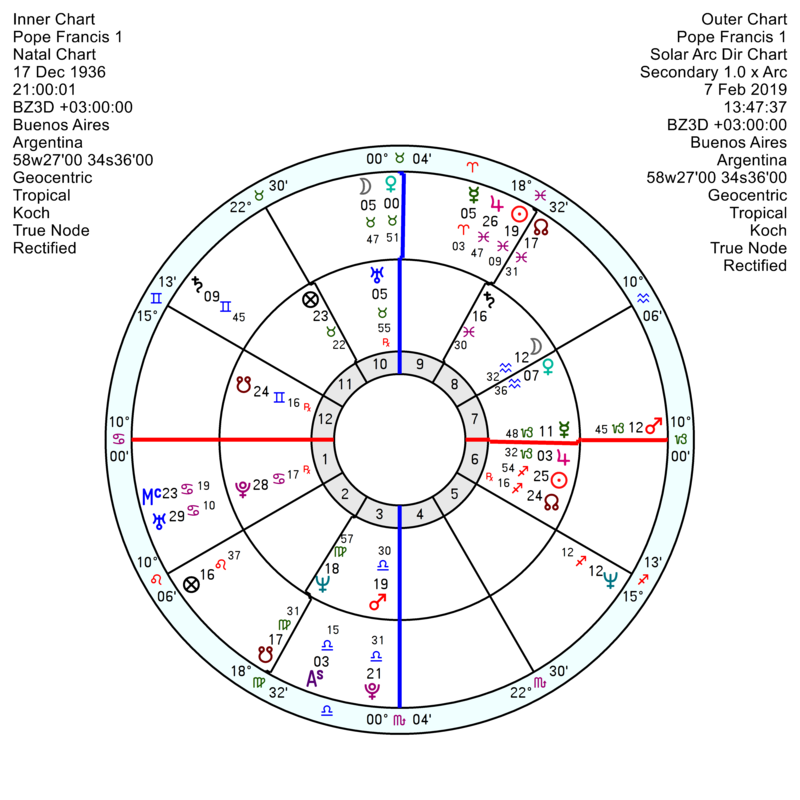 2018 was a year of upset and upheaval; with another disruption or sudden decision almost exactly now as his Solar Arc Moon is conjunct his 10th house Uranus. 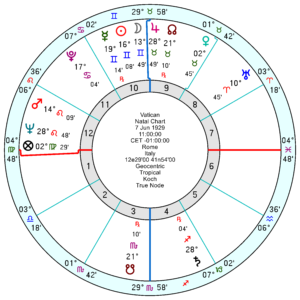 He also looks disheartened till late this year with tr Neptune conjunct his Saturn. 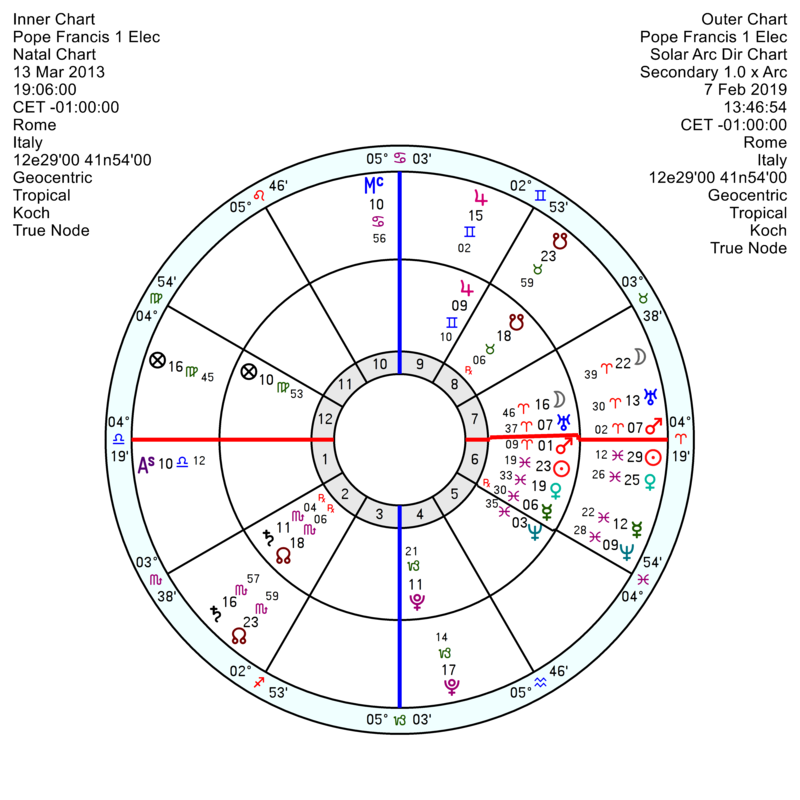 His relationship chart with the Vatican mirrors those feelings and experiences with disappointment and evasion; and sudden change on the cards with Pluto Uranus influences picking up this month and running on and off till late 2020. 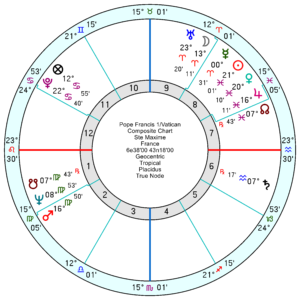 The Vatican itself, 7 June 1929 11 am Rome, with its confident Jupiter in indulgent Taurus on the midheaven and a slippery Gemini New Moon looks deflated this year and is getting a sharp elbow from tr Uranus conjunct its Venus to alter course, but I wouldn’t hold my breath or wager the family silver on it making a significant difference anytime soon. 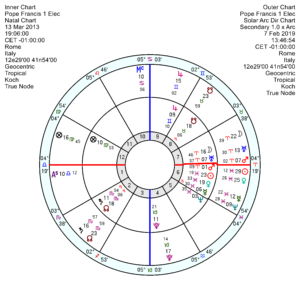 Maybe as tr Pluto moves across the midheaven around 2023/24 might shift it marginally in a better direction. Thank you. There appears to be no end to the corruption. I also think there will be a resignation in the near future.